Janelle joined Seder & Chandler in 2017 after graduating from Northeastern University School of Law. Her primary practice areas are civil litigation, family law and commercial litigation. Janelle grew up in Central Massachusetts and attended Worcester Academy. Prior to joining the firm, she was employed as a law clerk for a small firm in Worcester, where she worked on foreclosure prevention, consumer protection and personal injury matters. 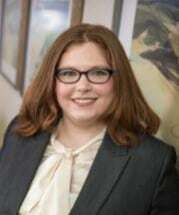 During law school, she also worked as a legal intern in the Family Law Unit of Community Legal Aid, where her work included representing clients in Family and Probate Court as a certified Student Practitioner. She also completed an internship with a local immigration firm and served on Northeastern's Admissions Committee. Prior to law school, she was employed by a municipal debt collection firm for two years after graduating from Bryn Mawr College.